TEAC CR-H500DNT review | What Hi-Fi? Large, space-eating hi-fi separates aren't for everyone. There are occasions where a micro system such as the CR-H500DNT is the way forward. 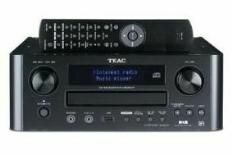 The TEAC's sophisticated look and solid build quality ensure that you don't feel like you're settling for second best. The brushed aluminium remote control adds to the appeal. Amplification is 40W per channel. On the rear there's a couple of RCA inputs and a subwoofer pre-out should you wish to inject a bit more bass. The Ethernet connection and small plastic aerial give clues as to the unit's versatility. Its integrated wi-fi functionality allows you to access the wild world of internet radio, or stream music from your PC. On front of the unit is a 3.5mm auxiliary input, a headphone jack and a USB input for connecting an iPod or other MP3 device. The TEAC is hindered, though, by a small display – frustrating when you're searching for stations. Connect the TEAC to a suitable pair of speakers – Wharfedale Diamond 10.1s or Monitor Audio Bronze BR2s, say – and it serves up a substantial, full-bodied sound, a clear improvement on budget systems of this type. There's excellent differentiation between bass notes in Kanye West's Love Lockdown, and the song is delivered in a very even tone. However, this system requires greater bite and attack to really grab the listener's attention – the track sounds polite and apologetic. If the TEAC could show greater enthusiasm, this system would go from being good to great.